Is the Fujifilm XT-2 Capable of Creating Gorgeous, High Quality Image Files? After a stop at Publix for some vegetables, Jim and I made it back to Indian Lake Estates at 8:34pm. I slept 8 1/2 hours. I have lots of work and exercising to do before I fly to Long Island to visit my 94 year old Mother in Holbrook and my younger daughter and her family as well. Today’s blog post marks a totally insane, irrational, illogical, preposterous, absurd, completely ridiculous, unfathomable, silly, incomprehensible, what’s wrong with this guy?, makes-no-sense, 434 days in a row with a new educational blog post. As always–and folks have been doing a really great for a long time now–please remember to use our B&H links for your major gear purchases. For best results use one of our many product-specific links; after clicking on one of those you can continue shopping with all subsequent purchases invisibly tracked to BAA. Your doing so is always greatly appreciated. Please remember: web orders only. And please remember also that if you are shopping for items that we carry in the BAA Online Store (as noted in red at the close of this post below) we would of course appreciate your business. This image was created at La Jolla, CA with the hand held Fujifilm XF 100-400mm f/4.5-5.6 R LM OIS WR lens, the Fujifilm XF 1.4x TC WR teleconverter (at 521.6mm–equivalent 782.4mm) and the Fujifilm X-T2 Mirrorless Digital Camera body) outfitted with the Fujifilm VPB-XT2 Vertical Power Booster Grip. ISO 800. Pattern metering probably at zero: 1/400 sec. at f/7.8 in Manual mode. AWB. Is the Fujifilm XT-2 Capable of Making Gorgeous, High Quality Image Files? In a word, and quite obviously, yes (at least to me while viewing the converted TIFF files). Simply by choosing the XT-2 Astia Soft preset (available in updated versions of Photoshop Creative Cloud) the image colors are quite pleasing and rich. I love the BLUEs–after increasing the luminance–and I toned down the REDs–by decreasing the luminance (both during the RAW conversion). To access the various profiles first click on the Camera Calibration tab and then select the profile that you want from the dropdown menu in the Name box under Camera Profile. Then head back to the Basic tab and adjust the various sliders as need be to your taste. Stay tuned for my complete review of the Fujifilm XT-2/XF 100-400mm f/4.5-5.6 R LM OIS WR lens with both teleconverters for bird photography. BTW, hand holding a relatively lightweight rig at equivalent 782.4mm and making sharp images is pretty cool. 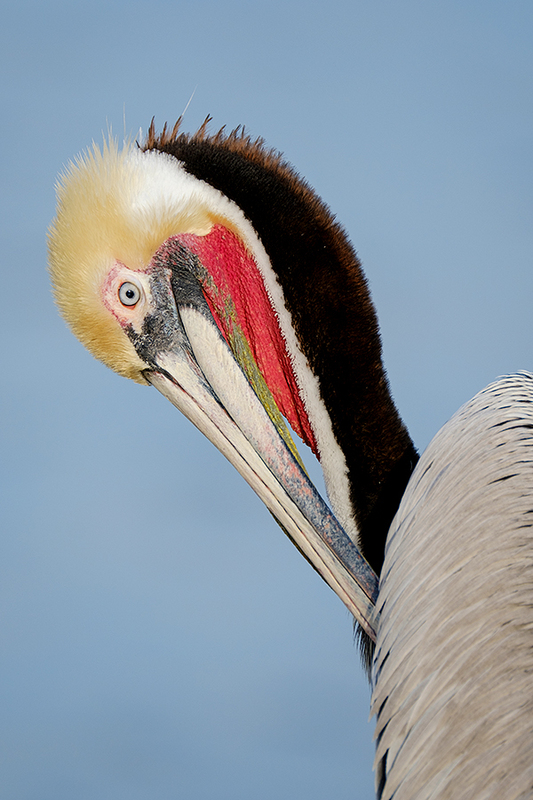 It seems that pelicans spend half their waking hours preening. Whether they are preening their breasts or their backs or getting oil from the uropygial gland the key to the success of these images is to make the image when the bill is perfectly parallel to the imaging sensor. Note that in today’s featured image that the bird’s face and the plane of the bill are perfectly parallel to the back of the camera. Crop factor bodies like the 7D II and the XT-2 often bring up too much background detail because of the “extra” depth of field that they provide. With the Pacific Ocean quite distant that was a non-factor with today’s featured image. Note that when the backgrounds are relatively close to the subject that this “extra” depth of field can be a negative. In what ways will the 2017 BIRDS AS ART Palouse Instructional Photo-Tour be different from the most other Palouse workshops? There are so many great locations that a seven-day IPT (as opposed to the typical three- or five-day workshops) will give the group time to visit (and revisit) many of the best spots while allowing you to maximize your air travel dollars. In addition, it will allow us to enjoy a slightly more relaxed pace. You will be assured of being in the right location for the given weather and sky conditions. You will learn and hone both basic and advanced compositional and image design skills. You will learn to design powerful, graphic images. You will visit all of the iconic locations and a few spectacular ones that are much less frequently visited. You will learn long lens landscape techniques. You will learn to master any exposure situation in one minute or less. You will learn the fine points of Canon in-camera (5D Mark III, 5DS R, and 7D II) HDR techniques. You will learn to use your longest focal lengths to create rolling field and Urbex abstracts. 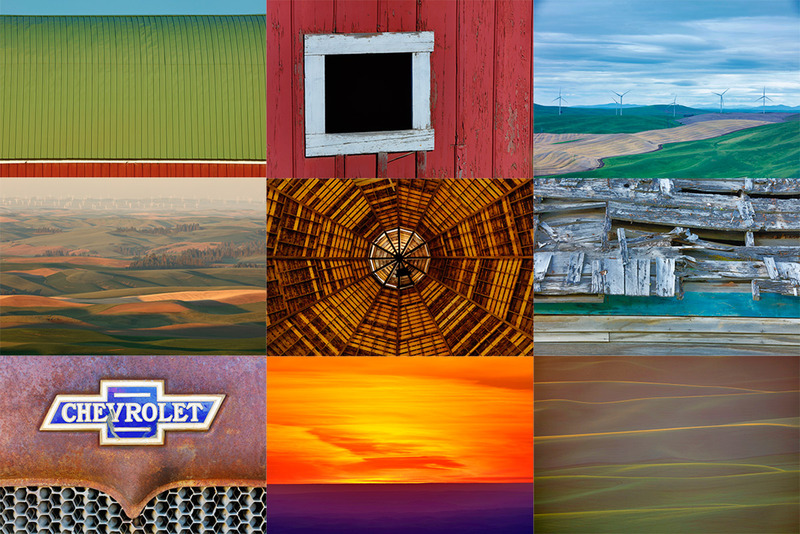 You will learn when and how to use a variety of neutral density filters to create pleasing blurs of the Palouse’s gorgeous rolling farmlands. As always, you will learn to see like a pro. You will learn what makes one situation prime and another seemingly similar one a waste of your time. You will learn to see the situation and to create a variety of top-notch images. You will learn to use super-wide lenses both for big skies and building interiors. You will learn when, why, and how to use infrared capture; if you do not own an infrared body, you will get to borrow mine. You will learn to use both backlight and side-light to create powerful and dramatic landscape images. June 8-14, 2017. Seven full days of photography. Meet and greet at 7:30pm on Wednesday, June 7: $2,499. Limit 10/Openings: 7. Rolling farmlands provide a magical patchwork of textures and colors, especially when viewed from the top of Steptoe Butte where we will enjoy spectacular sunrises and at least one nice sunset. We will photograph grand landscapes and mini-scenics of the rolling hills and farm fields. 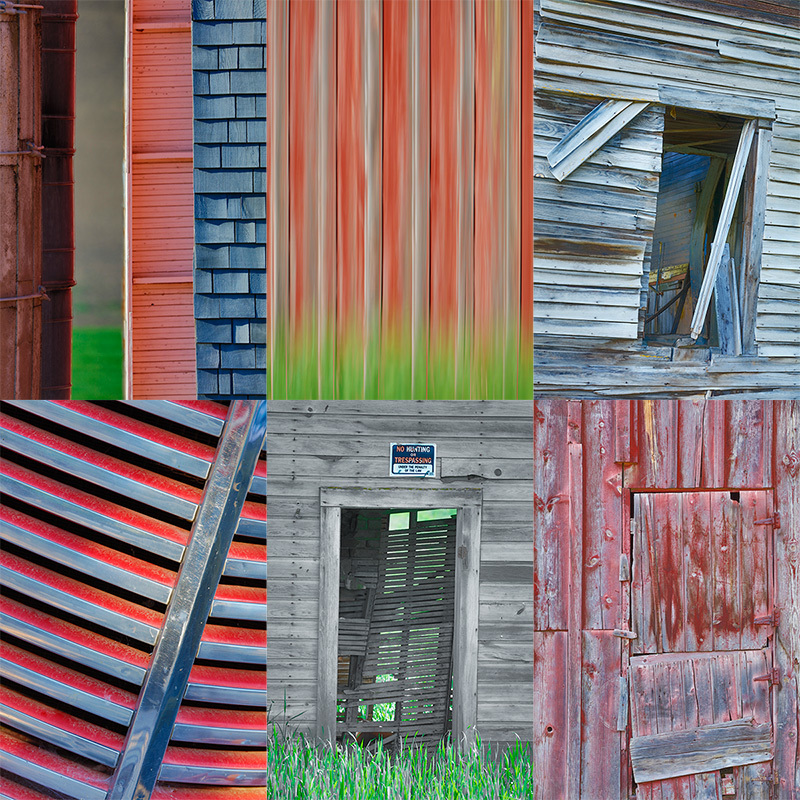 I will bring you to more than a few really neat old abandoned barns and farmhouses in idyllic settings. There is no better way to improve your compositional and image design skills and to develop your creativity than to join me for this trip. Photoshop and image sharing sessions when we have the time and energy…. We get up early and stay out late and the days are long. Over the past three years, with the help of a friend, we found all the iconic locations and, in addition, lots of spectacular new old barns and breath-taking landforms and vistas. What’s included: In-the-field instruction, guidance, lessons, and inspiration, my extensive knowledge of the area, all lunches, motel lobby grab and go breakfasts, and Photoshop and image sharing sessions. As above, there will be a meet and greet at 7:30pm on the evening before the workshop begins. Your non-refundable deposit of $500 is required to hold your spot. Please let me know via e-mail that you will be joining this IPT. Then you can either call Jim or Jennifer at 863-692-0906 during business hours to arrange for the payment of your deposit; if by check, please make out to “BIRDS AS ART” and mail it to: Arthur Morris/BIRDS AS ART, PO Box 7245, Indian Lake Estates, FL, 33855. If you have any questions, please feel free to contact me via e-mail: artie. Travel Insurance Services offers a variety of plans and options. Included with the Elite Option or available as an upgrade to the Basic & Plus Options. You can also purchase Cancel for Any Reason Coverage that expands the list of reasons for your canceling to include things such as sudden work or family obligation and even a simple change of mind. You can learn more here: Travel Insurance Services. Do note that many plans require that you purchase your travel insurance within 14 days of our cashing your deposit check. Whenever purchasing travel insurance be sure to read the fine print carefully even when dealing with reputable firms like TSI. 10 comments to Is the Fujifilm XT-2 Capable of Creating Gorgeous, High Quality Image Files? I also just bought an XT2 for street photography. My only disappointment so far is that I cannot use (or figure out how to use) Auto ISO in Manual mode. Anybody know if this is possible? Set your X-T2 to whatever aperture you desire. Set the shutter speed as you would like. Set the ISO dial to ‘A’ and your camera will use whatever ISO is necessary to use your settings and get a good exposure. Sorry, I stated the question wrong. I meant using auto ISO with Exposure compensation in manual mode. Exposure compensation does not seem to work with auto ISO in manual mode. Sorry for the confusion. For street photography I think it is worth using. I like being able to control my shutter speed and aperture and let the ISO adjust automatically as conditions change. If Exposure Compensation worked in Manual Mode, then you do have the control for this kind of shooting. I don’t think EC works in manual mode in the Fuji though so I don’t think I will be shooting auto ISO much. I was wondering if you could put a picture taken with the Fuji and one taken with a Canon on you web site that could be down loaded full size which would allow compaison for sharpness, noise, color and contrast. When I look at the pictures that you post they are not large enough files to allow the comparisons which people would like to make. I think this might help people see the quality similarities and differences between the two camera systems. Thanks for the suggestion Brian. I am not in the habit of giving away RAW or full-sized TIFFs of good images as it is not too smart to do so. Are you looking to compare similar images of the same subject made in close proximity to each other? If yes, what about the crop factor? Would you be interested in seeing the RAW files or converted TIFFs? Would you be willing to pay a small fee to get your hands on two full resolution files? Hi, Artie. Wonderful image. As i’ve said before, you can make great images with any camera, and i’m sure the Fujifilm does produce wonderful files. My questions would concern AF speed and accuracy and current drain and ease of use of the electronic viewfinder. Safe travels to Long Island. I hope you find your family well. This blog post reminds me that I have been meaning to ask you why you write “raw” in all caps as if it were an acronym, which it is not. The XT-2 AF is not up to the task of easily photographing birds in flight and in action at this time. I will be publishing a single good flight image with that camera soon so it is possible. Just not easy, for me at least. Though they are surely different, I disagree as to “less crisp” (and I am unsure what a precise image is).